If you have no experience of venous insufficiency, you have hardly seen its consequence, like leg ulcers (picture 1), which become an additional health concern. It demands a lot of medical attention. How do leg ulcers start? The increased pressure of blood in the veins of a lower limb leads to penetration of the fluid under the skin, which gets damaged due to that. At the beginning the patient usually feels itching and burning at that very place. The affected leg may be swollen. The skin gets covered with rash. 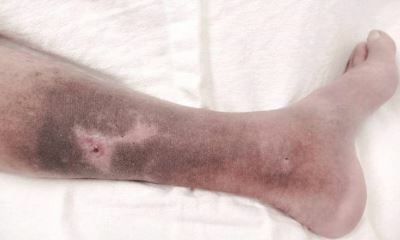 The further leg ulcers symptoms are connected with stasis dermatitis. There can be lumps near the place, where the ulcer is developing, but not yet breaking the skin. Then small leg ulcers (images at the bottom) appear in the form of open wounds or thick scabs. In both cases the affected area is painful. First they can be washed with warm soapy water and covered with bandage. The medication should be prescribed by a physician. The wound can be bleeding, in this case bandage is changed from time to time. The skin around it usually gets brownish. One of the undesired developments is infection, when chronic venous insufficiency ulcer is already diagnosed, it is high risk of microbial invasion. This state means slow healing, increase of wound size, and systemic illness. 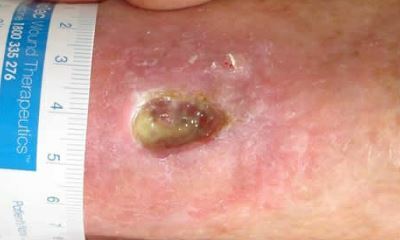 The venous skin ulcer (picture 2) looks like a wound developing without any injury mostly. It appears when the veins in legs are not able to transport blood in the direction they are expected. This condition is a disorder known as venous insufficiency, which often starts with spider veins – reddish or blue threads visible on the surface of skin being not dangerous on their own account. But if the reason for abnormal blood flow is not removed, the vascular ulcer (pictures below) will occur most probably. It can develop on the sides of the lower part of the leg – somewhere between the ankle and calf. The main problem of having those wounds is that they are difficult to be healed and moreover, even when you succeed, it often returns, if the preventive measures are not assumed. 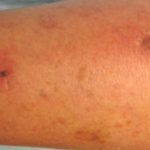 The skin ulcers on legs are characterized by dark red environment. The skin turns to be dry and thick. The patient experiences itching. If nothing is done, the venous stasis ulcer (pictures in the gal.) with irregular margins develops. It can be painful or painless depending on the complicity of the case and infection. Thus, such an invisible at first sight disease as blood clot on skin can lead to a range of sever conditions. The venous leg ulcer (images below) is a wound of irregular form, which increases in size and can be bleeding. It can also ooze pus in case it is infected. There is an opinion that leg sores (picture 3) do not heal at all, but this is not true. They should not be ignored and the treatment should be started as soon as possible. Unfortunately this vein illness symptom is not easily removed, but still it responds to medications. Taking care of it, a patient prevents more severe affects. The leg ulcers (pics bottom) usually develop somewhere around ankle. They are rather large and can weep a lot. The wound is surrounded with red and swelling skin, which can be covered with discolored splotches. The tightness in calves appears. The legs are felt heavy. Usually the leg sores superficial, but if nothing is done, they will penetrate deeper in tissues and can achieve the bones. This is a threatening situation, when gangrene is possible. When should you start becoming concerned? If you have chronic venous insufficiency, there is a risk. Even if you found just a broken blood vessel in foot or somewhere else, you should visit a doctor. It may look like a bruise or red spreading of cells known as spider veins. This is one of the first signs of problems with your veins, which may lead to ulcers in due course. 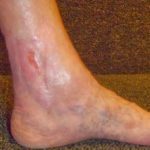 What does ankle ulcer look like? If you ask this question, perhaps, you experience a kind of break of the skin, which needs to be diagnosed. 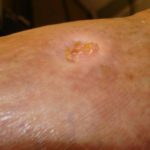 Still vascular wounds (pictures below) can be recognized without medical examination. First of all, it develops somewhere near the ankle and the damaged skin has a particular appearance. It is swelling and getting reddish or even purple. This happens due to increased pressure of blood provided by improper operation of the veins. The patient can suffer from discomfort in the affected area. The skin becomes itchy, dry and thick. The rash can appear. The next stage is ankle ulcers (picture 4), which are often painful and increasing in size if they are not treated. These open wounds or more seldom scabs can bleed. You can confuse them with an arterial ulcer developing because of lack of blood supply. In other words the reason is reduced blood flow, while the venous ulcer is a result of blood pressure. So if you feel uncomfortable and notice dvt symptoms leg should be examined with respect to wounds. If there are signs of ulcers, turn to a physician. There are various reasons for leg ulcers (photos below). If the arteries are not able to carry nutrient-rich blood to legs, the tissues suffer and become ruined. 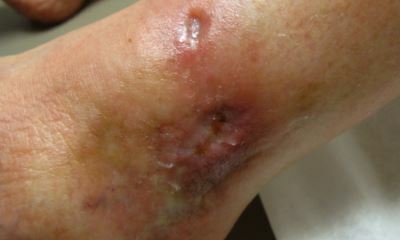 The tissue necrosis causes arterial leg ulcers (picture 5) which differ from venous leg ulcer. They usually do not bleed. The base of wound can be black but usually it is yellow or brown with grey. When the leg is elevated, the ulcer turns to be pale. The skin around the wound is cool to touch and appears atrophic because the blood circulation is poor here. The patient feels pain at night or at any other rest. 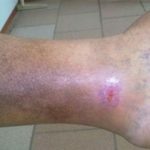 If this condition is compared with the ulcers appearing as a result of varicose veins in legs, it should be mentioned that there is not swelling and any inflammation of the skin around the damaged area. 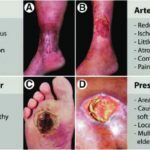 Moreover, there are cases of arterial foot ulcer (pictures in the gallery), which are very painful and inconvenient taking into account the continuous loading of this area when walking or standing. Arterial ulcer developed in any place is rather dangerous as far as left untreated, it can lead to tissue necrosis, infection and even amputation of the limb where there is a wound.